The summer is my favorite time of year! The weather is nice, the food is so fresh and delicious and people just seem happier. I am always trying to do things to feel my best. In the summer, it is easier than in the winter to eat better, exercise more because the weather is nice, etc. In Michigan, we only have nice weather for so long and therefore, I make sure to get outdoors every single day. This includes going on walks, runs, trips to the park, swimming in our local pool, grilling outside, sitting on our patio, etc. There is something about enjoying the outdoors that personally, makes me feel so great. I think that seeing some sunshine is so good for us and make sure to get outside. 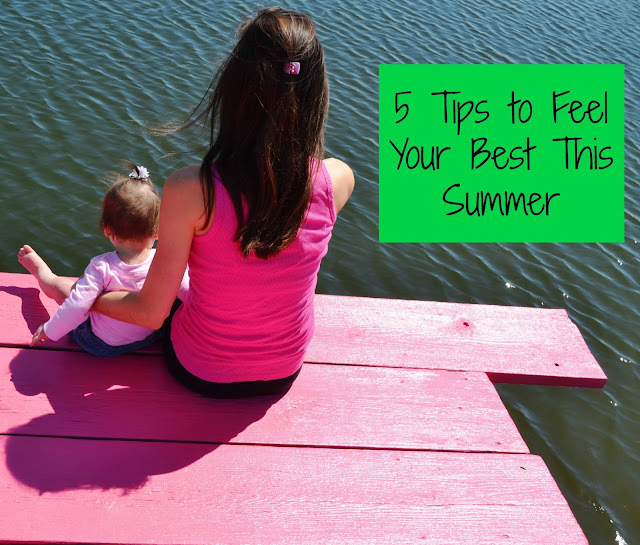 The summer sun can be brutal and dehydrating. If you are outside, make sure that you have water on you so that you do not get dehydrated or get heat stroke. Now that Adalyn is old enough to drink water, I make sure to give her enough on a hot day. Another okay choice is unsweetened iced tea. You know how I love to talk about fruits and vegetables! In the summer, we have the best fruits and vegetables available and they are usually super fresh. Choose your favorites and try a few new ones. My favorite way to eat fruits are just plain and my favorite way to eat vegetables are marinated in a homemade dressing and grilled. Before you go outside, even if it is cloudy out, you should be lathering up with sunscreen. I really realized how important this was this year with a baby. I do not want Adalyn to get a sunburn which could be very harmful so if she goes outside for more than a few minutes, we lather her up in sunscreen of at least 50 SPF. We are trying to be better about putting sunscreen on ourselves as well. We have been using this Neutrogena beach defense SPF 70 sunscreen from Walgreens. There are a lot of summer activities that can be dangerous: setting off fireworks, extreme sports, being out in the extreme heat too long, etc. Be very careful doing activities that can be dangerous- it is not worth it to get hurt. If you do get minorly hurt, pull out your Band-Aids from Walgreens to cover up your scrape or cut. These are part of the Johnson and Johnson Healthy Essentials products which are aimed to help keep you healthy this summer. I like using hydrogen peroxide to clean out my cut and then a triple antibiotic to make sure that it does not get infected. Walgreens has a great Balance Rewards program which I have been using for years. When you purchase certain products, you can earn points to earn money back on these purchases .They also have a Balance Rewards for healthy choices app which can help you continue your healthy routine over the summer months. If you are looking to lose weight, exercise more or boost your health, you can track these goals on this app. 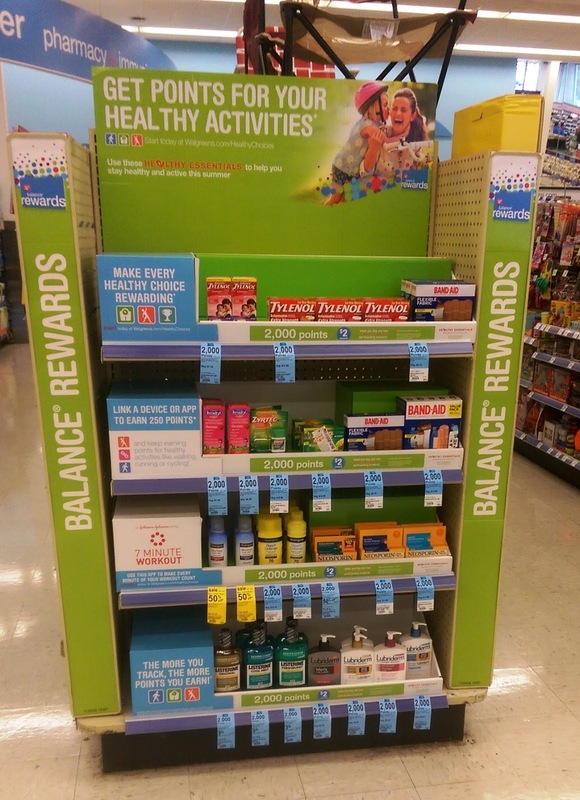 You will earn points for completing healthy activities.